Nearly 200 nations hammered out a legally binding deal to cut back on greenhouse gases used in refrigerators and air conditioners, a Rwandan minister announced to loud cheers on Saturday, in a major step against climate change. As Rwanda’s Minister for Natural Resources, Vincent Biruta, began spelling out the terms of the deal shortly after sunrise on Saturday, applause from negotiators who had been up all night drowned out his words. They needed more time because they have fast-expanding middle classes and hot climates, and because India feared damaging its growing industries. “Last year in Paris, we promised to keep the world safe from the worst effects of climate change. 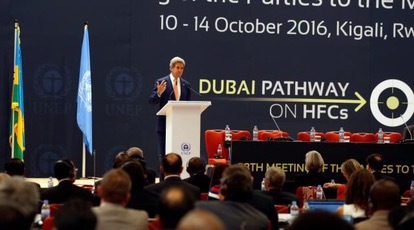 Today, we are following through on that promise,” said U.N. environment chief Erik Solheim in a statement. The United Nations says phasing out HFCs will cost billions of dollars. But a quick reduction of HFCs could be a major contribution to slowing climate change, avoiding perhaps 0.5 degrees Celsius (0.9 Fahrenheit) of a projected rise in average temperatures by 2100, scientists say. The aim was to stop the depletion of the ozone layer, which shields the planet from ultraviolet rays linked to skin cancer and other conditions.